(320 KB, Version 0.9.0.4, 10. 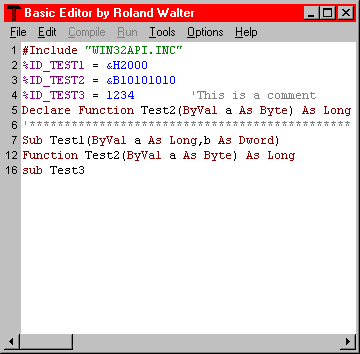 October 2012) This editor was special made for PowerBasic and FreeBasic. The Sub/Function/Macro toggling was the true reason to create the editor. You can close a sub/function/macro to a single line and make the rest of the sub/function invisible. This makes your listing very clear and once you are familiar with it you'll never miss it. You can open or close a sub/function/macro either with a mouse click to the left margin or by menu "Edit/Toggle..." or with keyboard shortcuts. The editor is based on the Scintilla edit control. First I had to write a special Lexer in C++ an then I made a special much smaller Scintilla release for PowerBasic/FreeBasic only. The edit control resides in an own DLL. The ZIP file contains all information You need to create Your own editor if You like. (16KB) This small command line tool links a binary Win32 resource file (*.res) into an executable (exe or dll). 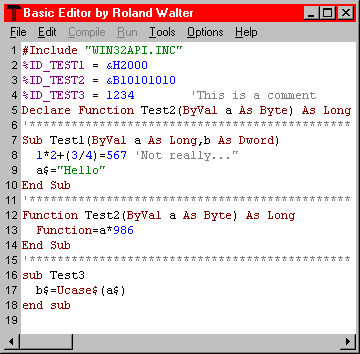 Binary resource files you can create using the Borland Resource Workshop, with the Microsoft Resource Compiler and many other resource compilers. 2. I use (and like) PowerBasic for Windows but the 32 bit PowerBasic compiler doesn't handle binary resource files directly - first You have to convert the resource file into a special format. This wasn't very handy for me.